With a variety of business suites and email clients available in the market, most of the people use office utilities of multiple service providers. In such cases, data transfer between the products become quite critical. Being products of different organizations, these services often do not support each other. As a result, users have to take help of some dedicated tools. For example, if you use both G Suite and Outlook and you require to migrate Outlook email to Google Apps, you got two options in front of you. One is to use GSMMO / GAMMO tool and another is to use GAMMO Alternative tool. Here, users will learn about both the tools and how these tools work. Users can also get to know the Google Apps migration failure an internal error occurred please check the log file for more details error which occurs while using GAMMMO tool. GSMMO (previously known as GAMMO) stands for G Suite Migration for Microsoft Outlook is a dedicated tool by Google. Its sole function is to perform data migration from PST to G Suite. This utility can be downloaded from the site of Google completely free of cost. After installation, users can easily choose the Outlook data they want to import and the tool will transfer the selected data to G Suite. Despite being a tool developed by Google, GSMMO has certain limitations. 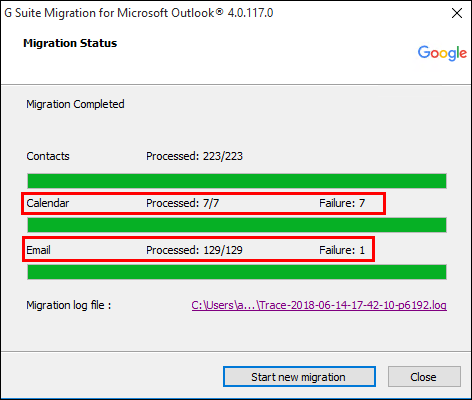 Compulsory Outlook installation: To perform Outlook to G Suite migration the tool requires Outlook installation on the system. Otherwise, the tool will not get installed on that particular system. No, Remove PST Option: in GSMMO, the users once browsed any particular PST file, they will not be able to remove it. To add another PST file, they have to start from the beginning of the tool. Generates log file: After the completion of Outlook data migration to G Suite, the tool generates a log file that contains details of the export process. Apart from these limitations, users have reported facing some errors during and after PST to Google Apps migration through GSMMO. Here we are going to shed light on those errors and how users can avoid getting these errors. A) Some or all of my data is not importing from Outlook: This is one of the most common errors users face after exporting data from PST to G Suite by GSMMO. In this case, usually partial data gets imported into G Suite. Sometimes, GSMMO fails to import any data from Outlook. **While using Outlook to G Suite tool, no such error occurs, as it seamlessly migrates all the selected MS Outlook data to Google Suite. 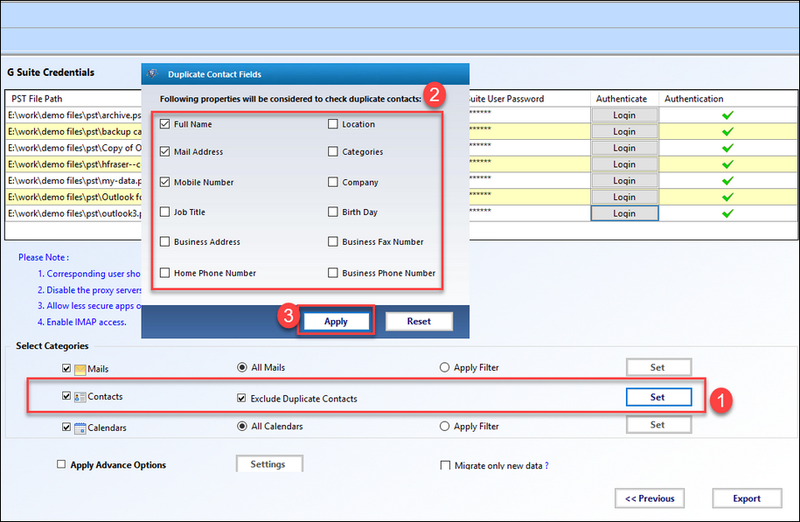 B) I am getting duplicate contacts in my Address Book post-migration: In case users import their contacts multiple time from Outlook, the issue of duplicate contacts can occur. This is often very annoying and confusing. **PST to Google Apps Software has an option to exclude duplicate contacts. Once enabled, there will not be any duplicate contacts in G Suite after the migration process. C) Classes not getting imported: All email messages contain some message classes like read receipts, delivery, and non-delivery report etc. Currently, GSMMO does not import these classes of the message. For this reason, users do not get this information in G Suite if they migrate the data by GSMMO. **In place of GSMMO, if users use the mentioned application, this issue will be resolved. The program supports migrating all these message classes, so users will also have these imported in G Suite. D) Timeout error: This error usually occurs when users try to import a large number of messages over a slow network. Even in case of importing emails with large-sized attachments, users often get this error message. **When the application is used, timeout error does not appear even when running on the slow network. If users use GSMMO for PST to G Suite migration, any of these errors are common to appear. In order to avoid these error, professionals suggest using SysTools Outlook to G Suite application. It has been seen in user experience that these errors do not occur when this software is used to migrate data from PST to Google Apps. In the previous section also, we have demonstrated how these errors can be avoided by using this application. This tool is also devoid of the limitations of GSMMO. This tool does not require Outlook installation, and it has the option to remove already added PST file. It also supports both complete and selective migration. Users can exclude attachments, Sent Items, and trash folder while importing. In a nutshell, this is a far better option that GSMMO for transferring data from Outlook to Google Apps. In this post, we have discussed two different ways of migrating Outlook data files to G Suite. We have also focused on the issue i.e Google Apps Migration Failure an Internal Error Occurred that users frequently face while conducting the migration by GSMMO tool. Considering the whole scenario, we have come to the conclusion that GSMMO tool gives rise to some errors while migrating Outlook files. Apart from this, it also has some limitations. For smooth and error-free migration, users can try the cited software. This program not only performs complete Outlook data export, it also allows users to skip all the GSMMO errors.